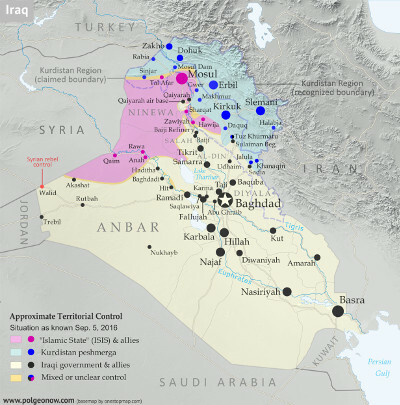 This map, which will be regularly updated for members of our conflict map subscription service, has been more than half a year in the making, with careful effort put into balancing detail with clear and concise design. For towns shown on the map, the timeline below links to sources for almost all control changes since the end of our previous Somalia map series in 2013. Behind the scenes, we're also tracking numerous smaller towns, villages, and rural areas, and using this information to illustrate areas of control on the map. Details and hints on control outside major towns (and even on real situations in the cities) have been painstakingly scoured from various local newspapers, government-researched reports, aid organization documents, and the amazingly-detailed free online ACLED conflict database (see footnote for full citation). Why So Little Government Control? Forces serving the Federal Government of Somalia - mainly the African Union Mission in Somalia (AMISOM) and the less-powerful Somali National Army - now control most of the major towns and cities in south and central Somalia. 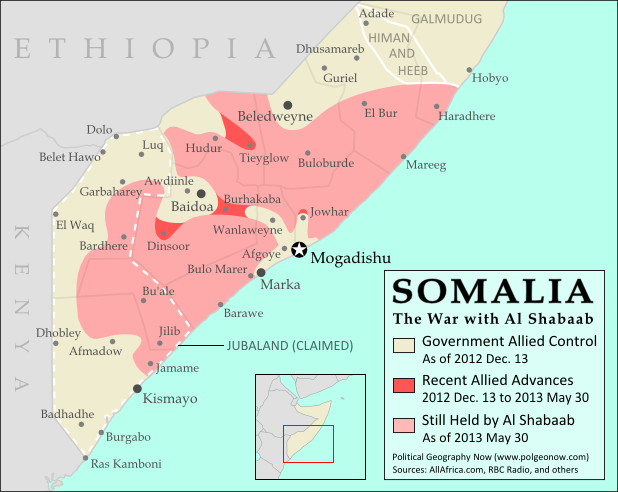 Pro-government press releases, and some third-party maps, often extend this to imply that the federal government controls most of Somalia's south. However, candid assessments from people on the ground, supported by detailed analysis of local journalism, consistently tell a different story: that the Al Qaeda-affiliated Al Shabaab rebels have free rein right up to the outskirts of major cities, and still rule supreme over many remote villages. Labeling all these sparsely-populated rural areas as "Al Shabaab controlled" might be an exaggeration, since the group likely doesn't actively patrol or administer every one of them, and is unlikely to stand its ground when well-armed pro-government forces pass through. But the pro-government alliance clearly isn't asserting control there either, so we've concluded that "mixed, lawless, or unclear control" (golden yellow on the map) is the most accurate way to label these areas. In more isolated areas where pro-government forces dare tread only as part of a major military offensive, Al Shabaab might be considered more properly in control, and we've marked these in red according to our best estimates. Similar areas of mixed control exist between autonomous administrations in northern and central Somalia, and in turn between them and pockets of Al Shabaab and "Islamic State" (IS) activity. Uncertainty also plays a role, with even some larger towns switching hands frequently, or news media failing to report on smaller territorial changes. We believe that being honest about uncertainty increases the quality of our mapping, so we've chosen to apply the yellow shading in any area that we don't have substantial reason to believe is truly administered or secured by a particular group. Mogadishu and Marka: Government or Al Shabaab? Two large cities are of particular note: In Mogadishu, the national capital, Al Shabaab regularly proves that it's able to easily infiltrate the city and launch devastating attacks. But because the city has a mostly-unopposed civilian administration run by the Federal Government of Somalia, and because pro-government forces are clearly the dominant military force, we've still marked it on the map as government-controlled (black). Meanwhile, the southern port city of Marka (Merca) is also usually claimed as a government-controlled town. An AMISOM contingent is stationed on the outskirts and makes shows of force within the city center, often after well-publicized (alleged) takeovers by Al Shabaab. However, a December 2016 Danish government report - based on interviews with the leader of a humanitarian organization in Somalia and other local sources - concluded that control of the city was in fact "disputed and uncertain", even describing it as "a mix between Al Shabaab control and a vacuum of power." We believe this situation justifies marking it with mixed/unclear control on the map. 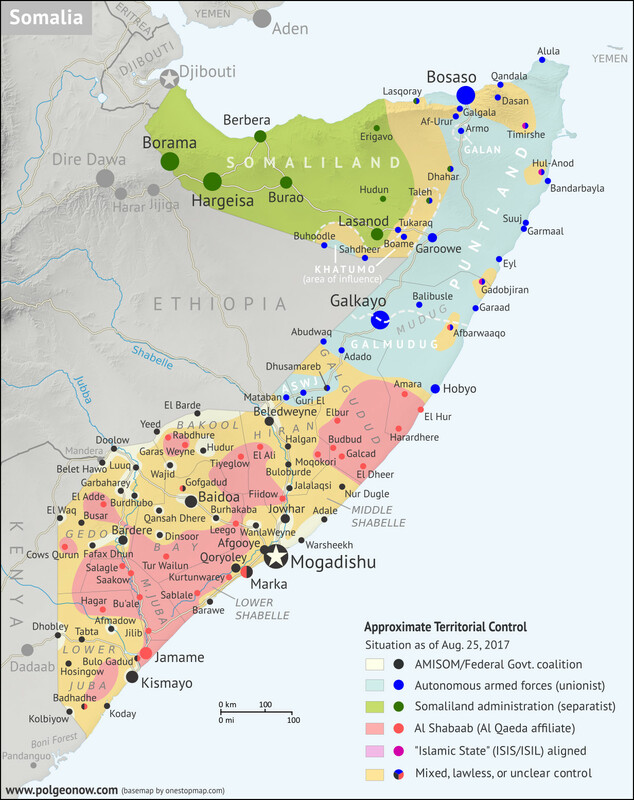 The following is a timeline of of major political events, changes to territorial control, and mass violence in Somalia since the last installment of our previous Somalia control map series on May 30, 2013. Sources are provided as in-line links. Somali government and African Union Mission in Somalia (AMISOM) troops captured four towns in Qoryoley district and one other of the Lower Shabelle region, plus El Ali and three other villages near Beledweyne, from Al Shabaab. Al Shabaab fighters attacked a UN office in Mogadishu, leaving at least 15 people dead, including four foreign and four local security workers plus seven of the group’s own fighters. Two of the foreigners worked for South African state weapons firm Denel, while the UK was looking into reports that three British nationals had died. Infighting broke out between two factions of Al Shabaab, one led by top leader Ahmed Godane and the other by American-born Abu Mansoor Al-Amriki. Al Shabaab’s spiritual leader, Sheik Hassan Dahir Aweys, left Al Shabaab territory after the infighting and sought refuge, along with his militia, in the Galmudug area. Two days later, he was arrested in Mogadishu by security forces as he flew in for negotiations with government officials. Meanwhile, two days of fighting between rival militias in Kismayo left at least 71 civilians dead and over 300 injured. The warlord Colonel Barre Adan Shire stated he would retake Kismayo after his forces had been pushed out of the city by a militia supported by Kenyan troops the previous month. Ethiopia announced it was withdrawing its forces from Baidoa, handing control of the major city to AMISOM. The self-declared autonomous Puntland state announced it was cutting ties with the Federal Government of Somalia in Mogadishu, citing disagreements over power-sharing. In a bid to end clashes between rival militias in Kismayo and surrounding regions, the Mogadishu government and a Kenya-backed militia signed a deal to create an autonomous “Interim Jubba Administration” in the country’s southwest. This federally-sanctioned government would replace the militia’s unilaterally-declared “Jubaland State” (however, “Jubaland” would continue to be used as an informal name for the Interim Jubba Administration). Abu Mansoor Al-Amriki was killed in the Bay region when a large group of Al Shabaab fighters attacked his smaller group. A Briton was also killed in the infighting, while an Egyptian from Al-Amriki’s group was captured. Al Shabaab fighters conducted an attack on the Westgate Shopping Mall in Kenya’s capital city of Nairobi. A four-day siege ensued during which the four attackers killed 67 people, including 19 foreigners. All of the attackers also died. Four of the foreigners were British. Hundreds of Ethiopian troops arrived in Baidoa, the capital of Bay region, establishing new military bases in preparation for operations against Al Shabaab. Ethiopian troops already in Somalia were set to join AMISOM in 2014. Meanwhile three bombs, one possibly a suicide bombing, targeted the Jazira hotel in Mogadishu, leaving 11 people dead and 17 wounded. A small team of US military advisors were confirmed to be present in Somalia for the first time since the US military ended its previous deployment in the country in 1993. The 1993 withdrawal came in the wake of the infamous “Black Hawk Down” incident, when 18 US soldiers were killed after the downing of two military helicopters amid heavy street fighting between US forces and a Somali militia. Some 4,395 Ethiopian soldiers in Somalia were formally integrated into AMISOM. An isolated pocket of Al Shabaab-loyal fighters attacked the town of Galgala in Puntland after being targeted by Puntland security forces in the surrounding areas. Government forces destroyed an Al Shabaab outpost in a town 50 kilometers north of Afmadow, in the country’s southwest. Al Shabaab fighters attacked Villa Somalia, the official residential palace and main workplace of the President of Somalia in Mogadishu. Fourteen people were killed in the attack, including nine Al Shabaab members and five soldiers or officials. One of the dead was General Nur Shirbow. Ethiopian troops from AMISOM seized the town of Rabdhure, in the Bakool region, from Al Shabaab. Two days later, Somali and Ethiopian forces captured the town of Hudur, the provincial capital of the Bakool region. They also took control of nearby Wajid district on March 9, as well as Burdhubo district in the neighboring Gedo region. The Jubaland administration denounced the proposed inclusion of its three regions - Gedo, Middle Juba, and Lower Juba - into a new autonomous “South West State” alongside Bay, Bakool, and Lower Shabelle regions. The idea to include the three regions in the new state, leading to armed confrontations between factions supporting and opposing it, would eventually be dropped, after being rejected by both the Somalia’s federal government and the UN. Government and AMISOM troops captured the town of Buloburde, in the central Somalia’s Hiran region, as well as a town 90 kilometers from Beledweyne. Several other towns in the Bay and Bakool regions were also confirmed captured. Somali and AMISOM forces captured the coastal town of Warsheekh, 90 kilometers northwest of Mogadishu in the Middle Shabelle region. A car bomb exploded at a hotel in Buloburde where AU and Somali officers were staying. This was followed by five hours of gunfire. Twelve soldiers were killed and 20 wounded in the attack. Somali and AMISOM forces seized the town of Qoryoley in the Lower Shabelle region. Somali and AMISOM forces captured Elbur (Ceelbuur) town in the Galgudud region and Moqokori in the Hiran region from Al Shabaab. Forces of breakaway Somaliland seized the town of Taleh, where representatives of self-declared Khatumo state were holding a government meeting, before withdrawing three days later. The town would still to be contested between Somaliland, Khatumo, and Puntland after a year. Somalia’s President Hassan Sheikh Mohamud declared that the first stage of the campaign to seize all areas of the country from Al Shabaab had been completed, with three million people and nine large towns coming under government control, although the campaign had not met all of its targets. He also accused Al Shabaab of trying to create food shortages and turn locals against the state in the government-captured areas. Somali and AMISOM forces reported they had captured more than half a dozen villages in the Hiran and Bakool regions, including two on the road between Beledweyne and Buloburde, as well as Garas Weyne and Rabdhure near the Ethiopian border (Rabdhure had already been reported captured three months earlier). Two rival administrations of the proposed South West State reportedly signed a deal to merge and create the federally-supported Interim South West Administration (ISWA), dropping claims to the Gedo, Middle Juba, and Lower Juba regions disputed by Jubaland State. However, the leader of the faction advocating the inclusion of the Jubaland regions soon denied having been represented at the meeting, and disagreements between the factions would remain for months. It was confirmed Buloburde had been under an Al Shabaab siege ever since government forces captured it in March. Due to all roads leading to the town being blocked by the group’s fighters, the only means of resupply was by air. The Federal Government of Somalia officially approved the formation of a new federal “Central Regions State”, which would merge the self-declared Regional State of Galmudug with the Administration of Himan and Heeb (another self-declared state, centered on Adado town) and Ahlu Sunna Waljama'a (ASWJ), an anti-Shabaab religious militia controlling some towns in the region. The next day, the government of neighboring Puntland state announced it was withdrawing its support of the federal government in protest of the decision, which it called “unconstitutional”. A major concern was that the new state’s mandate to administer Galgudud and Mudug regions would include Puntland-controlled parts of northern Mudug. It was unclear whether Puntland had ever actually restored ties with the Mogadishu government since suspending them in August 2013. The administration of Himan and Heeb formally signed on to become part of the new Central Regions State announced a week earlier. The autonomous state of Puntland fought an ultimately-successful two-month campaign to expel an Al Shabaab-loyal militia from strongholds in the mountains around Galgala. A new Somali-AMISOM offensive was launched in the central regions of Somalia, code-named Operation Indian Ocean. Among areas captured by October 28 were Barawe in Lower Shabelle, Tieyglow in Bakool, and Adale in Middle Shabelle, as well as numerous other villages. In addition, the pro-government forces took control of Koday, south of Kismayo, one of the last remaining natural seaports controlled by Al Shabaab, as well as a nearby inland town. The former warlord Colonel Barre Adan Shire agreed to join the ongoing Jubaland peace process. His militia had been pushed out of Kismayo by forces loyal to the President of Jubaland administration Sheikh Ahmed Mohamed Islam. A US drone strike killed the leader of Al Shabaab, Ahmed Abdi Godane. Puntland military reinforcements arrived to Dhahar in the disputed area between Somaliland and Puntland, after clashing with Somaliland-loyal militias five days before. Puntland state agreed to restore relations with the Federal Government of Somalia after three days of negotiations with international diplomats in attendance. The two sides agreed to a new framework for moving forward with federalism, and the federal government in Mogadishu agreed that the newly-approved “Central Regions State” would not include any areas of Mudug region currently controlled by Puntland. The new South West State was officially established with federal support, to include the Bay, Bakool, and Lower Shabelle regions. Barawe was chosen as its official capital. Federal government troops in Galgudud region seized Guri El town from the Sufa group, an ASWJ faction opposed to joining the Central Regions State. The group had gradually taken control of the town over the past month. After more power-sharing talks, the leader of the rival South West administration that claimed six regions - Bay, Bakool, Lower Shabelle, Lower Juba, Middle Juba, and Gedo - agreed to join the federally-approved three-region Interim South West Administration (ISWA), which considers the latter three regions to be part of neighboring Jubaland State. Al Shabaab fighters fleeing defeats in southern Somalia and Puntland reportedly regrouped in the southern part of Galgudud region, tightening their grip on an area they had controlled since 2007. An Al Shabaab attack on an AMISOM base in Mogadishu left 14 people dead, including eight Al Shabaab fighters, five AU peacekeepers, and a foreign contractor. The Sufa faction of the ASWJ militia recaptured Guri El town from government troops who had seized it in December 2014. A car bomb and a suicide attack against the Central Hotel in Mogadishu, frequented by politicians, left between 11 and 25 people dead. The Somali foreign minister and ASWJ signed a temporary peace agreement ending four months of fighting with ASWJ militia forces in Galgudud region. Under the ceasefire, government-affiliated troops would withdraw to Dhusamareb and ASWJ fighters to Guri El. Al Shabaab fighters attacked the Makka al-Mukarama hotel in Mogadishu, leading to a siege that ended early the next day. At least 20 people were killed and another 28 wounded. All five attackers were also among the dead, as well as the Somali ambassador to Geneva. Fifty people were rescued by security forces, including the Somali Ambassador to Germany. Al Shabaab fighters attacked the Garissa University College in Garissa, Kenya (southwest of Dadaab), killing 148 people. The siege at the university lasted nearly 15 hours. Four of the attackers also died when they were cornered by security forces and blew themselves up, while a fifth attacker was arrested. It was the worst terrorist attack in Kenya since the US embassy bombing in 1998. Al Shabaab fighters attacked the Ministry of Higher Education and Ministry of Petroleum and Resources building in Mogadishu. The attack also included a suicide bomber. Seventeen people were killed, including 8 civilians, 7 Al Shabaab members, and two soldiers. A suicide bomber attacked a UN vehicle in Garowe, the capital of Puntland state, leaving between 7 and 10 people dead, including four UN staffers. Al Shabaab fighters reportedly took over a village in the Mandera area of Kenya, near the Somalian and Ethiopian borders. Media reported that about 50 people had been killed in days of clashes between local Somali militias and Ethiopian paramilitary fighters along the Somali-Ethiopian border. Al Shabaab fighters attacked and captured an AMISOM military base in Leego, near Mogadishu. Between 50 and 70 Burundian soldiers were killed, while another 20 Burundian soldiers and 40 Somali civilians were missing and feared kidnapped. The base had been manned by about 100 Burundian soldiers total. The attack began with a suicide bombing at the base’s entrance, after which dozens of fighters stormed the facility. As many as 50 bodies were later seen, some decapitated, and most of them in military uniforms. Two days later, Somali and AMISOM troops retook the base. Somali government and AMISOM forces withdrew from Qoryoley and a nearby town in the Lower Shabelle region. Two days later, local government and civilian sources confirmed them to be under Al Shabaab control, although AMISOM denied its withdrawal. A conference was held in Adado to form a government for the new Central Regions State, which during the course of talks would become known as the Interim Galmudug Administration (“Galmudug” is a combination of the names of the state’s two constituent regions, Galgudud and Mudug, a name also used by the self-declared state previously occupying much of the area). 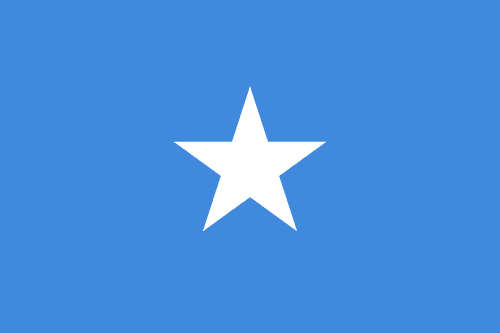 The delegates elected a parliament, president, and vice president, and adopted a state constitution that allegedly claimed jurisdiction over the entire Mudug region, despite federal government promises to recognize neighboring Puntland state’s authority over the region’s north. The constitution was reportedly revised on July 29 to withdraw any claims over northern Mudug. As part of the process of merging into the new Galmudug state, the outgoing Himan and Heeb administration handed over command of its military forces to Somalia’s federal police in Adado. The ASWJ militia, on the other hand, withdrew from the conference in protest of an alleged lack of representation, despite the federal government’s efforts to appease the group by declaring Dhusamareb the capital of Galmudug state instead of Adado. Just before the previously pro-Galmudug leadership of ASWJ withdrew from the conference, the group’s anti-Galmudug Sufa faction had seized the city of Dhusamareb from pro-federal forces in a surprise attack. Somali and AMISOM forces launched “Operation Jubba Corridor”, taking over strings of small towns from Al Shabaab west of Bardere in Gedo region and south and west of Baidoa in Bay region. The operation culminated in the capture of two major towns, Bardere in Gedo and Dinsoor in Bay, along with three areas near Hudur, including Garas Weyne. A suicide car bomber attacked the Jazeera Palace Hotel in Mogadishu, which hosts diplomats and top government officials, leaving 12 people dead. “Regional leaders, politicians, and elders” gathered in Jowhar signed an agreement to form a new federally-approved state from the Hiran and Middle Shabelle regions. The proposed state was initially called “Hiran and Middle Shabelle Regional State”. Some ASWJ factions reportedly chose to rejoin the Interim Galmudug Administration. Al Shabaab fighters attacked and captured another AMISOM military base, this one located near Marka and Qoryoley. The base was quickly recaptured. Between 19 and 21 Ugandan soldiers were officially confirmed killed, between 19 and 27 wounded, and one missing. This was the highest number of Ugandan soldiers killed in a single battle in the war. According to AMISOM sources, between 45 and 100 Al Shabaab fighters were killed and over 60 wounded. Al Shabaab itself claimed between 50 and 70 soldiers had died. The attack came on the one-year anniversary of the death of Al Shabaab’s leader, Ahmed Abdi Godane. Galmudug state security forces took over the town of Abudwaq from the ASWJ militia after a two-day battle. Al Shabaab fighters again captured the same AMISOM military base they attacked at the beginning of the month after AU forces unexpectedly vacated the base. The next day, the fighters briefly seized a Somali military base farther southwest of Mogadishu, before it was quickly recaptured. Between 9 and 13 soldiers were killed. Galmudug state forces recaptured Amara village in the southern Mudug region from Al Shabaab, after reportedly losing it two weeks earlier. Meanwhile, Somali and AMISOM forces captured a village in the Lower Shabelle region. Al Shabaab fighters stormed the Sahafi Hotel in Mogadishu. Security forces managed to retake the building after fierce fighting. At least 15 people were killed, including at least one member of parliament and the general who led the 2011 offensive that drove Al Shabaab out of Mogadishu. The attack also involved two car bombs. Al Shabaab faced a political crisis as, under pressure to switch its allegiance from Al Qaeda to the so-called “Islamic State” (IS; formerly ISIS/ISIL), some of its fighters defied their leaders to join IS. The group’s Al Qaeda-loyal leadership in southwestern Somalia cracked down harshly on pro-IS fighters, while in the mountains of Puntland, discussions led to powerful leader Abdulkadir Mumin pledging allegiance to IS. Fighters operating inside of Kenya were reportedly also divided, with northern groups operating around Mandera switching allegiance to IS, while groups operating in the southern Boni Forest area remained loyal to Al Qaeda. Meanwhile, fighting repeatedly flared up in Galkayo between two autonomous states: Puntland, which controls the northern part of the city, and Galmudug, which controls the southern part. And Kenya, hoping to stop cross-border attacks by Al Shabaab, announced it had begun constructing a 700 km wall along the border with Somalia. Al Shabaab took over Fiidow town, north of Mogadishu, after AMISOM troops vacated the area. A former unit of Al Shabaab now loyal to IS reportedly clashed with Puntland security forces in the mountains around Galgala. Local reports said Al Shabaab fighters seized control of another village inside Kenya. An Islamic State (IS) affiliated faction of fighters captured a village in Lower Jubba, about 12 km from Dhobley near the Kenyan border. Jubaland security forces recaptured the village two days later. Al Qaeda-loyal Al Shabaab factions clashed with pro-IS followers of Abdulkadir Mumin in Timirshe village of Puntland state. Afterwards, Mumin’s group reportedly retreated to the former pirate town of Hul-Anod. Three districts along the Ethiopian border of Bakool region declared they were leaving South West state to form a new “Upper Bakool” state. The president of Puntland announced support for the breakaway administration, and after two weeks reconciliation talks were announced between Upper Bakool and the administration of South West State. However, the Upper Bakool project, with its official capital in El Barde, was apparently still moving forward as of several months later. Some 300 Al Shabaab fighters attacked and captured an AMISOM military base at El Adde, in southwestern Somalia’s Gedo region. 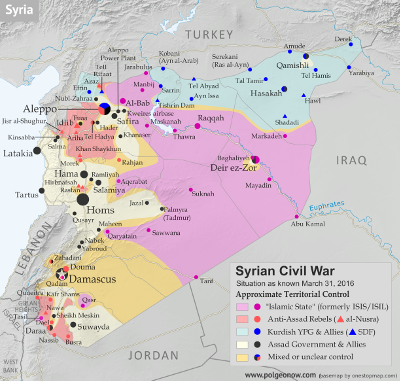 The attack was swift and began with a suicide truck bombing at the gate, followed by an assault by hundreds of fighters. Many soldiers were killed while they were still sleeping. It marked a potential turning point for Al Shabaab. Between 141 and 150 Kenyan soldiers were killed in the attack, while 11 more were captured, out of 200 soldiers stationed at the base. The base’s commander was also among the dead. Twelve civilians also died. The battle was described as a “tactical disaster” for Kenya and the worst military defeat in Kenya’s history. Due to this, the Kenyan military went to extreme lengths to conceal the extent of its losses and not provide any official casualty figures. All of the figures came from either the United Nations or investigative journalists. The base was recaptured five days later, while the Al Shabaab commander who organized the attack would die in an airstrike on January 21. Military forces of Somaliland attacked a base operated by Khatumo state forces in the town of Sahdheer. The result of the battle was unclear. Al Shabaab fighters attacked a seaside restaurant in Mogadishu, after which a siege ensued that ended in the death of more than 20 people. Kenyan forces withdrew from their bases at Badhadhe and El Adde. Both were subsequently captured by Al Shabaab. A suicide bomber blew himself up on a passenger plane as it set off from Mogadishu. The explosion left a hole in one side of the airliner, but there were no other fatalities and the plane returned to the airport. Al Shabaab fighters reportedly occupied the major port city of Marka (Merca) after AMISOM forces “re-adjusted their positions”. However, the peacekeeping force claimed it was still in control of the city. Three days later, reports said government and AMISOM forces had resumed control of the city without resistance. Al Shabaab fighters attacked the SYL hotel and a public garden in Mogadishu, leaving at least 10 people dead and 25 wounded. Four attackers also died. Two suicide bombers in Baidoa killed at least 30 people and wounded 40. The targets were a busy junction and a nearby restaurant. The ASWJ militia retained control of Dhusamareb town after fighting with what one news outlet described as a “renegade general” of the federal government’s army. Apparent Al Shabab fighters overran the coastal town of Garaad (Garacad) in Puntland state after reportedly setting off from Harardhere, but they had withdrawn by the next day. Fighters also were reported landing farther north at Garmaal village, as well as in Gadobjiran and Bandarbayla. Puntland security forces reportedly confronted and defeated the fighters in several days of clashes around Suuj, with confrontations and rumored negotiations also reported from Gadobjiran and Bandarbayla. It was widely suspected that the fighters landing along the Puntland coast were Al Shabaab defectors attempting to join Abdulkadir Mumin’s “Islamic State” (IS) unit in Hul-Anod, possibly even staging an intentional distraction for Puntland’s security forces as the faction’s leaders traveled directly to that town. By March 24th, Puntland forces claimed to have killed 167 Al Shabaab fighters and captured 100 in fighting around Suuj and Garaad, while Galmudug state forces said they apprehended fleeing fighters in the Hobyo and Galkayo areas. Al Shabaab reportedly captured Afbarwaaqo village in Galmudug state. Somali and AMISOM troops based in Budbud captured the nearby Galcad area from Al Shabaab. Somali and AMISOM forces seized Nur Dugle and two other locations in Middle Shabelle region from Al Shabaab. Human Rights Watch reported that the ASWJ militia was still in control of both Dhusamareb and Guri El. Dhusamareb is also home to an AMISOM base staffed by Ethiopian soldiers. Al Shabaab fighters stormed the Ambassador Hotel in Mogadishu, leaving at least 13 people dead and 40 wounded. Three attackers were also killed. Two Somali lawmakers were among the dead. Abdismad Mohamed Galan, the fired former mayor of Bosaso, Puntland state’s largest city, reportedly formed an armed rebel group with the goal of deposing the state’s president. Galan’s group then occupied Armo and other towns along the main road between Bosaso and the state capital of Garowe. Galan would apparently still be in control of Armo a year later, despite Puntland’s attempts at using both force and diplomacy to dislodge his forces. Al Shabaab fighters, including a suicide bomber, stormed the Naso Hablod hotel in Mogadishu, leaving at least 15 people dead and 25 wounded. For the second time in six months, Al Shabaab captured the port city of Marka after government and AMISOM troops withdrew. Several hours earlier, Al Shabaab temporarily overran a Somali government military base 40 km west of Mogadishu. Al Shabaab briefly captured Qoryoley, near Marka, before it was retaken by Somali and AMISOM forces the following morning. AMISOM reasserted control of Marka. Meanwhile, in the north, a Puntland-aligned former pirate leader clashed with the military of breakaway Somaliland in the town of Dhahar. Somalia delayed its presidential election from August to the end of October. Over 200 soldiers of the self-declared Khatumo state reportedly surrendered to the Somaliland military at a location 54 km from Buhoodle, as Khatumo’s leader announced peace talks between the two administrations. Somali and AMISOM forces in Gedo region captured four areas south of Bardere from Al Shabaab. Al Shabaab seized the town of El Waq near the Kenyan border, before it was recaptured by Somali forces by the end of the day. The US government said an airstrike it conducted in the Galmudug area left nine Al Shabaab fighters dead, while according to the Somali government 22 civilians and soldiers were killed instead. The Galmudug state government accused rival Puntland of tricking the US military into striking its territory, and Al Shabaab denied having any personnel in the area. =Meanwhile, Somalia’s presidential election was again delayed from October to November, while parliamentary elections were delayed until October 23. As of early October, Al Shabaab forces in southern Somalia were still in control of the towns of Jilib (described as their “capital”), Jamame, Bu'ale, Saakow, Badhadhe, Hagar, and Salagle. Government forces recaptured a town on the road from Afgooye to Marka after it was briefly taken over by Al Shabaab. Lengthy negotiations to form the Hiran and Shabelle federal state, which came to be known as “Hirshabelle”, concluded with the election of a president and vice president for the state’s interim administration, based in Jowhar. Meanwhile, an opposing political group was preparing to form a separate “Hiran State” with its capital in Buloburde. Al Shabaab fighters attacked a police station and several military bases in Afgooye, leaving 10 soldiers and civilians dead. The fighters eventually withdrew and government forces secured the town. Abdulkadir Mumin’s IS-loyal fighters captured the port town of Qandala in Puntland. Meanwhile, Al Shabaab captured the town of Tieyglow in Bakool region after non-AMISOM Ethiopian forces withdrew citing “lack of support” from the international community. This reportedly brought the number of areas seized by Al Shabaab following the July 2016 withdrawals by international forces to eight. The other areas retaken by Al Shabaab were Rabdhure, Garas Weyne, and a town between Rabdhure and Wajid in the Bakool region; Budbud and Galcad in the Galgudud region; and Moqokori, El Ali, and Halgan in the Hiran region. Four of the six federal states of Somalia completed their election of members for the new upper house of the Somali Federal Parliament. However, the elections for the more important lower house, which were supposed to take place between October 23 and November 10, had still not begun. The autonomous Puntland and Galmudug states agreed on a ceasefire to end clashes in the divided city of Galkayo, after talks mediated by the Somali federal government and attended by UN, European Union, and African Union representatives. However, fighting would continue to flare up into December. Al Shabaab fighters reportedly attacked a village on the outskirts of Garissa, Kenya (southwest of Dadaab). Elections for the lower house of the Somali Federal Parliament reached the halfway mark. A car bomb exploded at a market in Mogadishu, killing at least 20 people. Somalia’s presidential election, which was supposed to take place on November 30, was delayed for a third time to the following month. The Kenyan government announced that its stalled Somali border wall project had resumed construction, with three kilometers of a planned 30 km fence completed near Mandera. Puntland forces recaptured Qandala port from IS. A suicide bomber attacked Mogadishu’s port, Somalia’s biggest, killing at least 29 people. Somali officials accused AMISOM peacekeepers of killing 11 civilians in two separate incidents, one of which left a mother, three children and a baby dead. Meanwhile, Puntland security forces drove IS-loyal fighters out of a town 30 km south of Qandala, where they had been staging a new military build-up after withdrawing from Qandala itself. A new Somali parliament was inaugurated, an accomplishment welcomed by the Secretary-General of the United Nations. The country’s presidential election, on the other hand, was again delayed until January. Al Shabaab once again reportedly captured Moqokori town in the Hiran region without resistance after Somali and AMISOM forces abandoned it. Reporting in October had already listed the town as one of those retaken by Al Shabaab after widespread withdrawals of government-allied forces. Al Shabaab recaptured the Bulo Gadud district, near Kismayo, after losing several villages in the area the previous week. Al Shabaab temporarily captured large parts of the town of Afgooye, near Mogadishu, before its attack was repelled. The next day, a bomb planted by the group exploded at a base on the southern side of Afgooye, killing seven policemen. Jubaland forces, supported by AMISOM, captured the Al Shabaab stronghold of Badhadhe in the Lower Jubba region. However, within hours, Al Shabaab had retaken the town. Al Shabaab fighters attacked the Dayah Hotel in Mogadishu, leaving 28 people dead and either 43 or 51 wounded. Al Shabaab attacked a Kenyan military base at Kolbiyow on the Somali-Kenyan border. During the ensuing fighting, the group claimed at least 66 Kenyan soldiers were killed. The Kenyan military denied this, instead saying that 9 soldiers and 2 Kenyan policemen were killed, while also claiming that more than 70 Al Shabaab fighters died. Al Shabaab additionally claimed it had overrun the base and taken control of the surrounding area, which the Kenyan military also denied. Two Kenyan families who had lost their relatives in the attack on the Kolbiyow military base the previous month urged their government to withdraw its military from Somalia. The latest reports put the Kenyan military death toll from the base attack at 21. Fighters loyal to IS attacked a hotel in Bosaso city of Puntland state. Mohamed Abdullahi Farmajo was chosen as president by Somalia's MPs in a vote held in an aircraft hangar at the heavily guarded Mogadishu airport. It was announced that the pro-government ASWJ militia would be integrated into the Somali National Army “soon after the elections”, due to the group’s good relations with newly-elected President Farmajo. The breakaway region of Somaliland agreed to allow the United Arab Emirates (UAE) to build a military base in the port town of Berbera. The base would be used to fight forces of the unrecognized “Houthi” government in Yemen. A suicide car bombing at a market in Mogadishu killed 39 people and wounded around 50. Al Shabaab captured two towns from Galmudug state forces in the southern part of the Mudug region: El Hur on the coast and Amara farther inland. Dozens of soldiers in the autonomous state of Puntland briefly staged a mutiny by seizing the parliament compound in the state capital of Garowe, but withdrew to their barracks after a request by one of the region's most respected clan elders. The soldiers were protesting delayed payment of their salaries as well as poor working conditions. Somalia’s president requested that Saudi Arabia persuade the UAE not to build a military base in Somaliland. In one of the deadliest assaults on Al Shabaab, AMISOM and Somali forces attacked one of the group’s camps 31 km northwest of Afmadow, killing at least 57 Al Shabaab members. Al Shabaab briefly captured a military base eight kilometers southwest of Mogadishu, before its fighters were pushed back in fighting that left four dead on both sides. Two suicide bombing attacks killed nine people in Mogadishu near a hotel and a military base. Meanwhile, after five years without any major piracy incidents of the Somali coast, pirates hijacked an oil tanker named Aris 13 and anchored it in the town of Alula. The eight Sri Lankan crewmembers were also abducted. The ship was carrying fuel from Djibouti to Mogadishu. Pirates released the hijacked oil tanker Aris 13 after being confronted by Puntland security forces and engaging in negotiations. Government-allied Ethiopian troops abandoned Elbur town in the Galgudud region, with Al Shabaab taking control of it soon after. A suicide car-bombing in Mogadishu left 15 people dead. The target of the attack was Somalia's new army chief, who survived. The attack was said to be in response to the new president’s declaration of war against Al Shabaab. In the period between April 5 and 7, several other attacks in the capital had together killed 29 people. It was announced that the US would be sending dozens of soldiers to Somalia to provide logistical training to Somalia’s army. This would be the first time the US sends such a large deployment of troops to Somalia since the US military pulled out of the country in 1993 following the disastrous “Black Hawk Down” incident. IS-loyal fighters briefly took over Dasan village in Puntland, near Qandala, before withdrawing the next morning. It was reported that 52 Al Shabaab fighters were killed by Kenyan forces in an attack on their camp in the Badhadhe area of Lower Juba. Later reports said more than 100 fighters in Gedo region were killed by US airstrikes in El Adde and an area near El Waq. Al Shabaab withdrew from the town of Halgan, on the road from Beledweyne to Buloburde. Federal government-brokered talks to integrate the ASWJ militia into Galmudug state ended without an agreement. It was reported that a US servicemember was killed in action, and another two wounded, during a raid against Al Shabaab 64 kilometers west of Mogadishu. US forces were said to be conducting an advise-and-assist mission with Somali government troops. The death represented the first time a US servicemember had been killed in combat in Somalia since 1993. Al Shabaab captured the town of Gofgadud, about 30 kilometers north of Baidoa, following clashes that left 17 Somali soldiers dead. The town had apparently been reported taken by Al Shabaab on four separate occasions in 2016, often after underpaid troops vacated the area. However, some of the reports may refer instead to another village, Gofgadud Shabelow, about 25km southwest of Baidoa. AMISOM and Somali government forces reportedly moved back into Gofgadud. Al Shabaab overran the Af-towns Urur army base in the Puntland region, killing up to 70 people, including both soldiers and civilians, while at least 40 soldiers were wounded. The organization claimed to have captured the base and surrounding town, though the area was apparently back in control of the Puntland government the next week. Targeting Al Shabaab, the United States conducted its first airstrike in Somalia under the Trump administration. The town of Balibusle in Puntland state was attacked by an allegedly Galmudug-affiliated militia. An Al Shabaab attack on a popular restaurant in Mogadishu left 31 people dead and nearly 40 wounded. The attack started with a car bombing, followed by an all-night siege in which five attackers posing as soldiers took over the restaurant and held hostages. All of the attackers were eventually killed and a number of hostages were rescued, including foreign citizens. The self-declared states of Khatumo and Somaliland reached a peace agreement, which Somaliland media characterized as a deal for Khatumo to be absorbed into Somaliland. However, the agreement would stall over the following weeks amid reports of opposition from within both the Somaliland government and the Khatumo political establishment. A car bomb attack in Mogadishu killed at least 15 people. Suspected Al Shabaab fighters attacked a police post in Pandanguo, Kenya, with the ensuing battle lasting for at least seven hours. The following week, the Kenyan government was reported to be responding with airstrikes in the neighboring Boni Forest. A joint US-Somali attack on a force of about 100 Al Shabaab fighters near Kismayo left 13 of the fighters dead and 10 wounded. The president of Hirshabelle state announced an initiative to find a new, “sensible name” for the state. Al Shabaab ambushed AMISOM troops in the Lower Shabelle region, with the fighters claiming they had the bodies of 39 soldiers in their possession. The deputy governor of the region said government forces had carried the bodies of 23 AMISOM soldiers and a Somali soldier from the scene of the ambush. Uganda itself claimed only 12 Ugandan soldiers were killed. Somalia’s government announced that Turkey would soon be opening a large “military training camp” in Mogadishu. Al Shabaab captured the town of Leego, 120 kilometers from Mogadishu, after Ugandan AMISOM troops withdrew. The capture of the town effectively cut off Mogadishu from land access to Baidoa and the rest of the the Bay and Bakool regions. AMISOM and Somali government forces captured an Al Shabaab stronghold just west of Afgooye, near Mogadishu. A week later, controversy arose after ten civilians, including three children, were reportedly killed by a US-backed raid on the same town. The Kenyan government ordered residents of the Boni Forest area in Kenya to evacuate ahead of planned heavy airstrikes. Al Shabaab had reportedly killed 20 police officers and 10 local residents in the area over the past two months. Tensions were reportedly high along the road from Adado to Dhusamareb, as Galmudug forces and ASWJ fighters jockeyed for control of the area. Stay informed: Sign up for our professional conflict mapping service for regular updates to the Somalia map and timeline!